Home / Deal / Nanoarcade / retrogaming / Tabletop Arcade / Exclusive Offer For RD80s Followers! 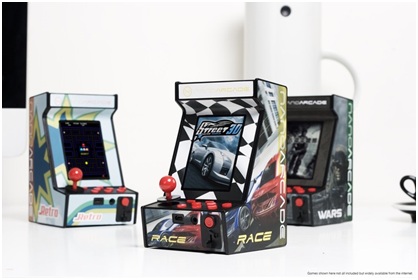 Save $5 On Nanoarcade Tabletop Gaming Console! Exclusive Offer For RD80s Followers! Save $5 On Nanoarcade Tabletop Gaming Console! Kickstarter backers were available to get the Nanoarcade value pack starter bundle for $59. The bundle included one black Mystic Nanoarcade console, a Nanoarcade certified microUSB cable, three pre-designed template stickers, and one blank template sticker. Through March 31, 2015 NanoArcade is still offering that same value pack starter bundle for $59, but I'm happy to announce that RD80s followers can save an additional $5 by using THIS EXCLUSIVE LINK and applying the $5 coupon code at checkout! The suggested retail price of Nanoarcade is $80 so use the exclusive link above now and save! Remember, this coupon code offer is only good through Tuesday March 31, 2015 so don't wait to get your hands on some retrogaming fun!